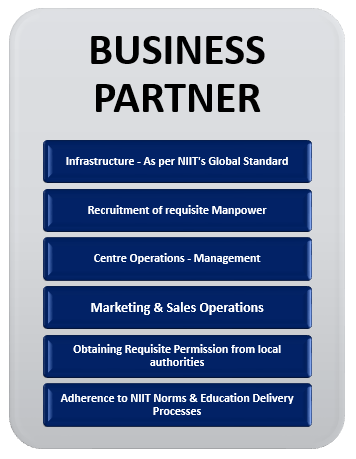 Why are you interested in partnership with NIIT? NIIT is a leading Skills and Talent Development Corporation that is building a manpower pool for global industry requirements. The company, which was set up in 1981 to help the nascent IT industry overcome its human resource challenges, today ranks among the world's leading training companies owing to its vast and comprehensive array of talent development programs. With a footprint across 40 nations, NIIT offers training and development solutions to Individuals, Enterprises and Institutions. 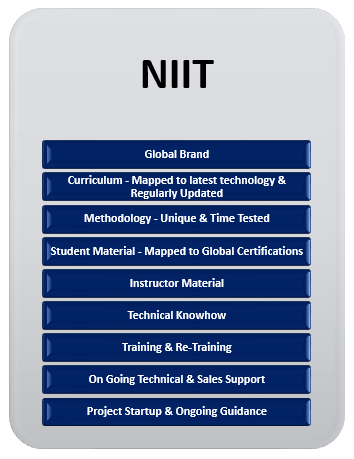 NIIT has three main lines of business across the globe –Global Corporate Business, Global Retail Business Skills and MindChampion Learning Systems Limited. NIIT equips franchisees with cutting-edge curriculum and courseware that makes it a preferred choice of individuals and enterprises. Remains involved with Business Partner in their strategic initiatives. NIIT offers training and development solutions to Individuals, Enterprises and Institutions. NIIT is offering programs in Digital Transformation Technology like Python, REST, Angular JS, REACT, R, Artificial Intelligence, Business Intelligence, Machine Learning in addition to DigiNxt MMS: Full Stack Developer, Data Analytics, Big Data, Java Enterprises Apps with DevOps, Digital Marketing apart from other program. Intensive 1- 2 ½ year program aimed at creating Full Stack Developers. Builds specific skillset in Python, REST, Angular JS, REACT and DevOps. Data Analytics course is designed to make one proficient in Data Analytics tools and techniques starting from the fundamentals of statistics going onto advanced use of tools like R and Python Artificial Intelligence, Business Intelligence. Professional Diploma in Digital Transformation - Digital Marketinghelps learners to understand how to plan, implement and manage a comprehensive digital marketing strategy in SEO, SEM, Mobile and Email Marketing, ORM. Big Datais high volume, high velocity information to process to enable enhanced decision making. It consist of Hadoop, Zookeeper, Hbase, Hive, Storm Distributed Live Computing and Sqoop. NIIT has been featured as ‘India’s Most Trusted Education Brand, 2017’ by Brand Trust Report for the five consecutive year. NIIT has been featured as the ‘Most Respected Education Company, 2016’ by Business World. NIIT has been awarded the ‘Best Innovation Brand’ in the Education sector at the ASSOCHAM National Brand Summit & Excellence Awards 2016 . NIIT has been recognized as the ‘Best Institute – Innovation, 2016’ by ASSOCHAM. NIIT honored with 31 Brandon Hall Awards for Corporate Training. NIIT received 8 ‘Brandon Hall Group Excellence Award 2015’ jointly with Shell, GE, MetLife, Zurich North America and Westfield Insurance. NIIT has been ranked #22 Gold LearningElite member in the CLO Learning Elite 2016 list. NIIT.tv - a disruptive innovation by NIIT has been awarded the ‘Best online education platform’ at the Indian Education Awards 2016. Highly experienced and certified Instructor. Learning resources like Physical Courseware for each students, Videos, reference sites, online assessments etc. Global leader in IT training & Africa’s largest IT Training Provider.